Mobile CRM is changing the way salespeople manage leads, opportunities and customers. Smartphones, tablets and mobile apps are making CRM accessible anytime, anywhere resulting in enhanced customer relationships and more business opportunities. Today having an advanced and feature rich CRM software is not enough if you don't have a mobile CRM app. A CRM system today is more likely to succeed if it takes into consideration the processes, systems and the working style of the organization as a whole. Similarly, it is more likely to be successful if it also incorporates a mobile strategy to empower the salespeople better. But is mobile readiness really as critical an element as it is made out to be? Let's have a look at some of the research that have been done in this regard and let the numbers speak. 1.According to a Forrester Research Survey of more than 1000 European organizations, mobile CRM leads to 74% increase in customer satisfaction and 84% increase in sales and employee productivity. 2.82% of the people using mobile CRM say that being able to access their system on mobile or tablet greatly or moderately improves the quality of their CRM data. 3.Salespeople using their CRM on both tablet and mobile realize more benefits like increased efficiency, better decision-making, better follow-ups, higher end-user adoption, etc than those that use either mobile or tablet. 4.Sales content management (37%) is the most used feature of the CRM, even ahead of adding or reviewing contact information (31%). 5.The top 3 requirements from a mobile enabled CRM include “seamless data synchronization across all devices”, an easy-to-use native mobile application for the CRM system and offline access. 6.64% salespeople cited the primary purpose of their mobile usage as being able to manage existing customers better through improved customer service and nurturing loyalty. 7.77% respondents considered mobile CRM an important component of their marketing toolkit because mobility allowed them to give a seamless experience to their customers across multiple devices and helped in uplifting digital marketing campaigns. 8.97% respondents considered it extremely or moderately important to update their CRM system with mobile data. 9.91% respondents agreed that their mobile campaigns would be more successful if the customer data from their CRM system could be used to inform mobile campaigns. 10.53% respondents considered technical limitations as the biggest roadblock in integrating customer data from CRM systems to enhance mobile campaigns. As the above data clearly point out, there is an undoubted business benefit of mobile CRM and one of the major hurdles in mobile CRM adoption and integration is the lack of technical prowess. But mobile CRM apps are becoming more and more adept at seamless integration with the enterprise CRM suite and that's a clear indication of how the future is going to be. All eCommerce stores continuously strive to implement innovative features in their online store that help them attract more buyers and help them differentiate themselves from the competition. In this respect, giving customers the ability to customize their products is a great way to provide value and attract more business. In an era of increasingly personalized solutions, there is no reason why ecommerce should be left behind. This is the reason why custom product designer tools are becoming increasingly popular as they are a great way to offer what your customers want. Using such tools, customers can play with the product features and benefit from custom made products. This is more true for certain product categories like apparel, paper and stationary, gifting and mobile and laptop accessories. Since Magento is one of the most popular ecommerce platforms, there is quite a demand for Magento product designer extensions. Fortunately there are quite a few options as well for such extensions. Given below is a brief overview of 5 such extensions (in no particular order) which give your online store the “coolness factor” it deserves. Brush Your Ideas from Biztech is one of the leading Magento custom product designer tools available in the market. It is an advanced tool to design T-Shirts, mugs, covers/cases of mobile and laptop, business cards, greeting cards, posters, etc. You can add any graphics on your product with masking & text effects, creative templates, cliparts, images and many other features. Biztech is known for it's high quality support for all its product and its true for Brush Your Ideas as well. Brush Your Ideas is available in three price packages - Professional, Professional Plus and Ultimate with prices ranging from $375 to $999. The Ultimate version has some unique features like multiple design area, brush tool, and design templates. All the 3 versions have 6 months free support and 12 month free upgrades. Biztech also provides additional customization services for Brush Your Ideas. With GoMage Product Designer from GoMage is another product design tools with similar features like Brush Your Ideas and 6 month free support and 12 month free upgrades. 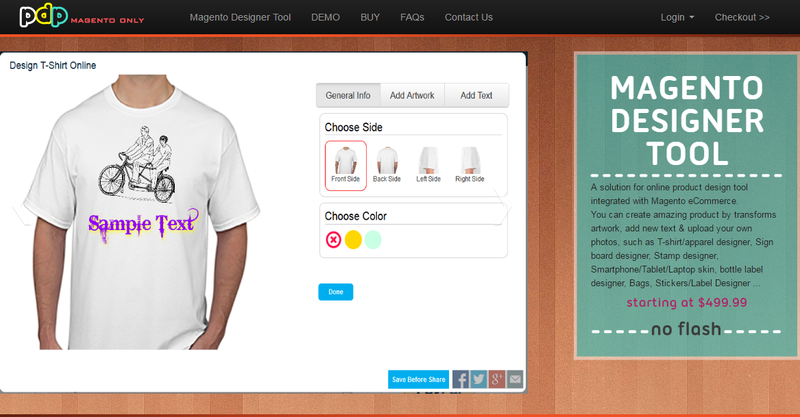 GoMage Product Designer allows uploading of your own images and clipart along with texts. However they do no provide any clipart of their own. 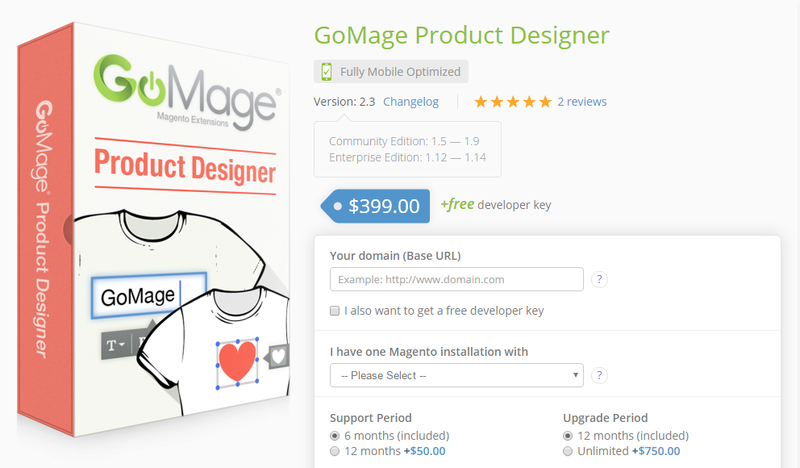 GoMage Product Designer is priced at $399 and comes with a 14 days case-by-case money back guarantee. inkXE is one of the most feature rich Magento product designer tools available in the market but comes at a premium price of $1999. They also have a monthly pricing option for $199. Product installation from the inkXE team is also chargable at $500. In terms of features they have a plethora of text and image customization features and a clipart gallery of 5000 items. 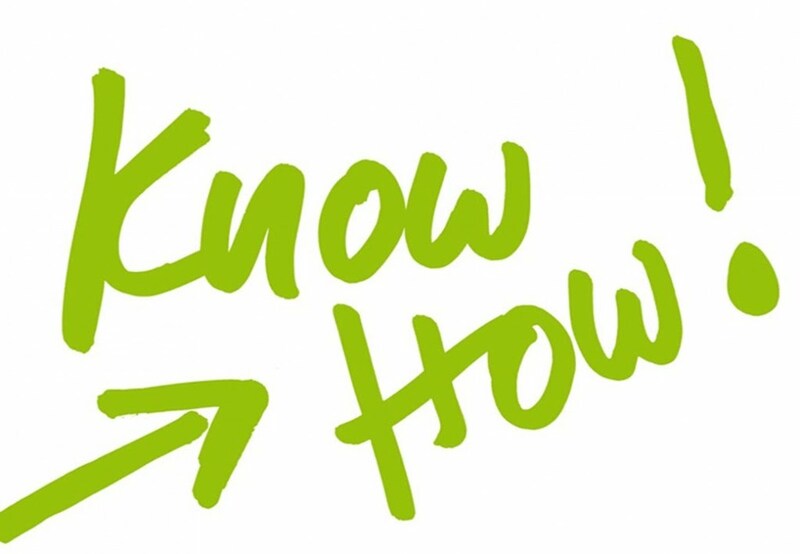 Their product video explains quite a lot but if you want a real time demo of the product you will have to schedule a demo session with the inkXE team. 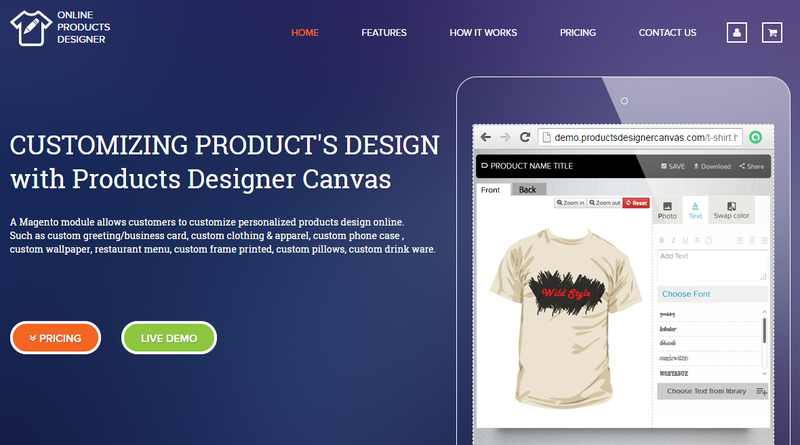 Full of features like any good product designer should, Product Designer Canvas offers text, clipart and images customization, photo upload, social sharing and many other features. It comes in four pricing packages - Standard, Pro, Enterprise and X3, with the price ranging from $399 - $1099. Installation is free for all editions except standard. 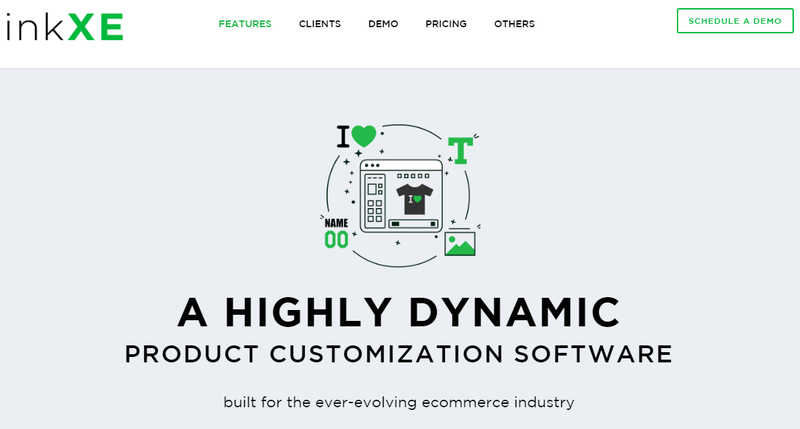 Product Designer Pro is not as feature rich as other extensions in this list and the product website and demo experience also is not upto the mark. PDP also comes in 3 pricing packages - the full suite “Enterprise” version costing $899. The base version PDP “Standard” comes for $399. Like others they also provide customization services for extra charge. However the overall experience of PDP leaves much to be desired. In this digital - mobile world, mobile apps are an integral part in personal and professional lives. In fact, people are so much involved in their smart phones, tablets and other gadgets that they get every second’s information on-the-go and on-the-fly. Literally, mobile apps make sense when they are of wide use for all. In majority cases, mobile usages are found helping grow sales team across the globe. And because of this, enterprise mobile apps are built in CRM to reinforce the business growth and agility. Mobile CRM applications appear to be cool to run business from any nook and corner of the world. Mobile CRM is growing super fast and there is no denial that, the market is also looking for such significant applications which come with SuiteCRM instance and help access business processes on mobile! As per the latest survey, in 2014, sales topped $23 billion; and he has predicted that, market will enlarge to 36. $ billion by the end of 2017 with a bigger picture of enterprise apps! More importantly, apps that help manage customers’ data on-the-move. Mobile apps built on SuiteCRM help operate businesses remotely! Not only this, such apps let users have dynamic functionalities while accessing customers’ data. Different CRM apps come with different modules like, contacts, leads, accounting, etc. ; all these can be easily accessed smoothly from distant places. CRM is a new wave of technological revolution that has been evolving rapidly. SuiteCRM is on the top of the list since it boosts the productivity of businesses by 27%! Another benefit is, it makes business owners proactive and vigilant on-the-go. Even in critical situations, such apps are a great boon to the businesses. It works offline and online. Customers’ data can be accessed all the time on the field. Automated and constant synchronization whenever internet connectivity is available. By 2020, mobile CRM applications will be the new standard for every business sector to manage their customers’ data remotely. By 2025, 55% of sales people will access sales apps importantly through their devices. CRM mobility will be of great customer driven, cost saving and productive gains! Stay connected with the newest technology trends and discover, how a mobile CRM helps you keep track of your business deals, nurture your business and so much more! A Mobile CRM application is one of the recent advancements in Customer Relationship Management systems. Advances in technology are increasingly providing customers with greater conveniences have changed the way in which the business operates. Today, a mobile phone or any other mobile device such as a tablet has become a must for people. The advantage of this to the business is that, it's simpler than ever to create a genuine mobile workforce. But you still need to give your sales persons the tools they need. And for any business using CRM, with sales people and other employees often on the move, CRM on their Phone has become a much important need. Services that a Mobile CRM offer, plays an important role in a new drift which aims to create and manage personalized customer relationships. With the ability to easily define access preferences to individuals and groups of users, anyone who needs to interact with customer data can use the application. This includes executives and sales managers, field service technicians, executives, CEOs and other employees. CRM apps can support your business objectives like increasing sales productivity, sales effectiveness and well-timed follow-up of leads or improved lead conversion rates, gaining a competitive edge, or even reducing the costs associated with sales staff turnover. “SuiteMob Pro” by Biztech is a CRM app solution that lets your mobile or remote sales workers or employees use mobile devices to access, update and interact with customer data wherever they are. It lets them do everything they could do with Customer Relationship Management at their desktop, with the addition of advanced mobile CRM features. Key attractions of SuiteMob Pro are mentioned below. CRM integrated Mobile solutions not only provide new opportunities on customer satisfaction, but also help make immense adjustments, savings and advantages for organized retail outlets. It is very much cost efficient with a great impact on the business growth! 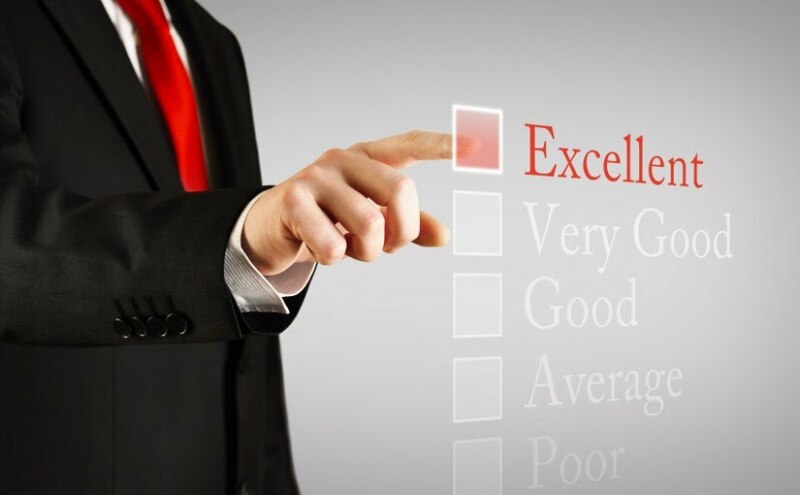 Fulfilling customers’ high expectations is a vital parameter for customer satisfaction when it comes to the ecommerce industry. In this regard, shipping is a very important component of the customer order fulfillment journey. How fast the products are shipped and how error free the process is, decides, to a large extent, how satisfied the customer is. For ecommerce store owners in Australia, Australia Post is a popular shipping partner. A large number of Australian online store owners have shipping methods fulfilled by Australia Post. Keeping this in mind, Biztech came up with a Magento Australia Post Shipping Extension for online store owners of Australia who ship parcels to domestic & international markets. This extension is particularly helpful in keeping pace with the frequently changing Australia Post regulations. Store owners can configure Australia Post Shipping Extension in their online store for domestic as well as international parcels and set their own handling charges, flat rate etc. offering improved shopping experience to their customers. In our previous blog, we talked about all the features and benefits of Australia Post Shipping Extension. In this post we will talk about two value added services which store owners can avail of along with the extension. Satchel Service : Satchel service is used to show rates of parcel shipped in box packing. If the dimensions of the parcel match the pre-defined weight and dimensions of the box in satchel system, it will generate rates for the parcel automatically. With Biztech’s Satchel integration in Magento Australia Post Extension, admin can show / hide satchel rates as per their need. The extension will fetch best matching box for parcel and display the rates accordingly. eParcel Matrix Rates Shipping Method : eParcel Matrix Rates Shipping Method is used to display customized shipping rates using CSV file for eParcel service. With Biztech’s eParcel Matrix Rates Shipping Method Service integration in Australia Post Shipping Extension admin can add desired predefined rates based on weight and dimension of parcel in CSV file. With Australia Post Shipping Magento Extension, admin can add handling fees for parcel, signature cost & insurance cost separately. This service will not integrate with eParcel service available by default, but will only display uploaded rates by CSV file. Thus, when you integrate Australia Post Shipping extension in your own online store, you not only get enhanced functionalities but also get value added services that give customers an enhanced buying experience thereby driving customer satisfaction. Now manage your WordPress customers better by offering the access to specific customers thus retaining data confidentiality. Reduce the time and effort in getting connected with your customers for any module related update as they can themselves update the data and you can view it in SuiteCRM instantly. Provide clients with a self-service customer portal to submit new cases and view the status & progress of cases managed in CRM, view invoices, read knowledge-base articles and more. Customer Portal Software is an accumulation point for content, functions, and features using web-based technology. In easier terms, it’s a key place for making all types of information accessible, allowing organizations to broaden business processes to the internet, expand their range, and reduce costs across sales, service and marketing. CRM integrated Customer Portal Solutions are no longer a dream. It’s a snap crack. Manage all your customer issues with an easy to setup and use Portal. With secure login verified from SuiteCRM, your sales or service teams will be instantly notified about customer’s issues and your customers will be able to know as soon as their issues have been dealt with. Safe and secure Portal Login for customers. A new user can directly sign-up from the Portal. The credentials will be verified to check whether any customer has been registered with same username and email address. If any such user does not exist in the system then a record will be created in SuiteCRM in the Contacts module. User can retrieve their password using Forget Password Option. Their password will be sent to their email address. Easily manage your profile from the Portal. Customers can edit their profile directly from the Portal and all the changes made in the Portal will reflect in the backend automatically. Set Portal Layouts for each accessible module. You can set Layouts for List, Edit, & Detail view from SuiteCRM and the same will be displayed in the Portal. Ever thought of acquiring or using innovative design tool, equipped with creative ideas? Through today’s technological products, we can present art work on any product by giving a personal touch. The versatile novelty is observed in a plethora of options available online. What matters here is “Personalization”! Yes, it is the key to design products. Personalization is seen everywhere in almost all industry domains, be it fashion, decor or any other that matters. Since we live in a technology oriented era, every individual prefers customized products as per the latest choices and trends. Tailor made things have gained a huge rage in the current days and eCommerce stores are coming up with brand new ways of customization. When it comes to designing products, each of us have different choice and taste, we want products as per our need and for that, there are numerous online tools available to design products. Customizing products creates a strong impression on customers/buyers. It helps form healthy relationship and improved business ethics. 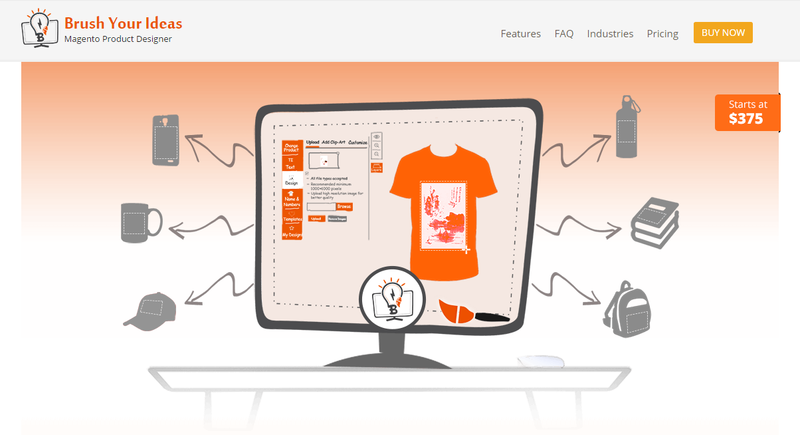 Online product design software have gained a niche over its versatility and it has increased the number of customers. Emerging technologies are being used by many industry verticals today and provide implicit personalization. It gives space to personal choices and very comfy to embellish the products such as shoes, caps, watches, pillows, t-shirts, bags, mugs and more. Customization becomes more unique when users and designers both have a creative inclination. Designs created by buyers open doors to many new businesses and thus welcome new products. 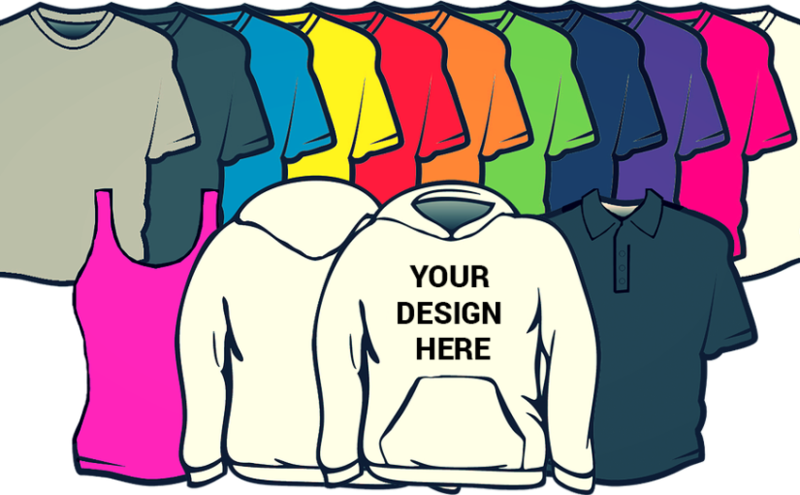 Further, the color, clip art, text, shapes, etc play a great role in customizing online products. Few people prefer to opt for colorful skins and covers that are trendsetters in the respective industries. It depends upon the buyers and the stores that what sort of products should be astonished in the end. The digitization has brought us to a level that carries out custom made features for various accessories and clothing. To explore such gift designer tools, one can visit any shopping site, check for customization options and select items and start designing with various strokes, colors and effects. This ultimately depends on the online stores how they help their buyers to personalize the products with options.